Hallelujah! 'Sister Act' is finally on Blu-ray! Why am I so excited? Well, because 'Sister Act' has all of the elements one looks for in an awesome 90s cinematic treat: singing, dancing, nuns, nuns singing and dancing, guns, Whoopi Goldberg, and… MONTAGES! Seriously though, I really do have a soft spot in my heart for this flick (blame nostalgia) and to this day I still think it's pretty damn entertaining. Sure, some aspects of the production are a bit dated, and while I recently harped on other catalog titles for similar issues ('Born Yesterday'), there's one big difference here -- 'Sister Act' actually remains a genuinely funny movie. Goldberg is great in her iconic role, and the silly but creative premise leads to some solid laughs. I mean, just look at that cover. Whoopi Goldberg dressed in a nun's outfit wearing sunglasses -- who are you to resist that?! After witnessing a murder ordered by her mob boss boyfriend (Harvey Keitel), a Reno lounge singer, Deloris Van Cartier (Whoopi Goldberg), goes on the run. Fearing for her life, she seeks help from the cops, who in their infinite wisdom decide to hide her somewhere the mob will never think to look -- a convent. Forced to pose as a nun herself, Deloris becomes Sister Mary Clarence. As she struggles to adjust to the nun lifestyle, she is asked to take over the church's struggling choir -- but just as Mary Clarence starts to enjoy her newfound calling, old threats reemerge. Like many beloved (and not so beloved) high concept comedies from the 90s, the film features a wonderfully absurd but still not altogether unbelievable premise. The humor mostly derives from Goldberg's fish-out-of-water predicament, and watching her character struggle to deal with life as a nun is quite amusing. The culture clash leads to some great reactions and uncomfortable situations, and unlike some other similar efforts, the script actually makes the most out of the silly concept with a few inspired but never mean-spirited jokes that chronicle the choir's journey from total ineptitude to rock-god status. The writers also resist the urge to become too outlandish, and for the most part, the whole affair is treated with a suitable sense of realism. Famous for its coupling of traditional choir music with pop sensibilities, the movie is home to some fun "churched-up" renditions of classic tunes and remixed versions of standard hymns. Who could forget such toe-tappers like "Hail Holly Queen," "I Will Follow Him," or my personal favorite, "My Guy (God)?" Beyond their humorous novelty, the musical numbers really are well arranged and choreographed, and it's legitimately entertaining to see the nuns take to the stage to do their thing. In fact, I've been humming the catholic hymns all week, which should make for interesting conversation during the Cohen family Shabbat dinner. Much like the seven dwarfs, there's a nun for all tastes here, ranging from bashful to happy to grumpy to… Maggie Smith. The entire ensemble, even the glorified extras -- actually, come to think of it, especially the glorified extras -- are all memorable and offer distinct personalities and quirks. While not all of the sisters get much on-screen development (or even dialogue) the core trio played by Kathy Najimy, Wendy Makkena, and Mary Wickes are given some decent material to work with. Covered up in their habits and robes, all we see of the actresses are their faces, but man, what faces! The expressions they make are hilarious, especially Maggie Smith's repeated looks of horror in response to basically anything Goldberg says or does. Speaking of Goldberg, she carries the picture with wit and class, and the film reveals some real heart as she starts to bond with her fellow sisters. Of course, the true highlight here is a cheesily awesome montage sequence that showcases the nuns doing what nuns do best -- namely feeding the homeless, running a daycare center, painting over graffiti with more graffiti, jumping rope, and… fixing cars. You know, like nuns do. (Are you starting to see why I love this flick so much?) Then there's the crazy climax that involves the whole convent invading a Reno casino while mobsters try to chase them down. The sisters scurry about the slot machines while perplexed gamblers -- and the movie-going public -- look on in amusement. Sure, elements of the script are a little dated, tacky, and clichéd, but beneath the 90s kitsch, lies a surprisingly solid story with likeable characters and fun comedy. Hallelujah! 'Sister Act 2: Back in the Habit' is finally on Blu -- wait, what? Damn it! Things were going so well there, Touchstone, but then you had to go and sully my disc with this nonsense. You know all those warm, fuzzy feelings I have for Sister Mary Clarence's first cinematic outing? Well, I don't have any of those for this pitiful attempt at a sequel. Even my six year old self could see right through this thoroughly mediocre effort when it was first released in theaters back in 1993 (just a year after the original). Lacking most of the charm and creativity that helped to elevate its predecessor, this follow-up is just dumb. Following the conclusion of the first film, Deloris has become a successful Las Vegas headliner, using her unusual nun experience as part of her show. When her former sisters come to visit, they plead for her help, begging her to come teach music at the St. Francis Catholic School. Though reluctant, Deloris accepts the offer, but since just seeing Whoopi Goldberg teaching kids in her regular get-up isn't enough, she is asked to once again don her habit and pretend to be Sister Mary Clarence. While at the school, she meets heavy opposition from a rag-tag group of clichéd students and must constantly ask herself, "How do I reach these kids?" After finally inspiring them through the gift of song, Sister Mary Clarence learns that St. Francis is going to be closed, and sets off to help the students win a choir competition in hopes of saving the school. Why would winning a choir competition help save the school? Your guess is as good as mine. While Goldberg and the returning nuns (Kathy Najimy, Wendy Makkena, Mary Wickes, and Maggie Smith) are all fairly likeable and still fun to watch, the whole film is ruined by a very contrived, asinine plot and a stock pile of one-dimensional teenaged characters. The premise of the original film certainly stretched reality, but was still believable. Here, however, the basic set-up that gets Goldberg back in her nun's outfit is pretty eye-rolling and extremely forced. Even after accepting that, the storyline completely lacks creativity and simply plugs Mary Clarence into a standard "charismatic teacher helping troubled students" movie. Think 'Stand and Deliver' or 'Lean on me,' only… not good. The student characters lack any real semblance of development or actual personality. They're just cardboard cutouts that perpetuate all of the worst 90s teenager clichés. We get the requisite "pretty girl" who likes to comb her hair (played by a young Jennifer Love Hewitt). I call her that because that's her only defining characteristic, and if her name was actually mentioned, I sure as hell don't remember it. There's the sarcastic slacker that everybody calls "Fran-kay." You know, because it's a cooler way of saying Frankie, or something. Even more clever is a rather sleepy young man nicknamed "Sketch," because he likes to -- yes, you guessed it -- sketch. Then there's Wesley Glen 'Ahmal' James whose obsession with getting in touch with his African roots is supposed to be a recurring source of hilarity (spoiler alert: it's not). The only character who gets a shred of development is Lauren Hill's Rita, but even then, her character's arc is nothing but a regurgitated template that involves her mother's disapproval of her singing (something tells me she'll probably come around). Now, I know some of you might be thinking, "But, Steven, according to your earlier assessment of the first 'Sister Act,' this film also contains all of the elements one looks for in an awesome 90s cinematic treat (sans guns), so how can you not love it?" Well, that's an interesting question, hypothetical reader, but how dare you sass me! Still, you bring up a good issue. In many ways, these two films perfectly demonstrate the all too fine line between slightly dated but still endearingly fun, and just plain bad. To further this point, one need only look at both film's montage sequences. The first film's montage made me smile, both despite and because of its inherent cheesiness. The montage sequence in the second film -- which focuses on Goldberg teaching the kids how to sing while forcing them to repeatedly chant "la la la" over and over again in different variations -- made me want to rip the disc out of the player, break it in half, and then jab each serrated piece into my ears. OK, that might be a bit of an exaggeration, but it is pretty groan inducing. 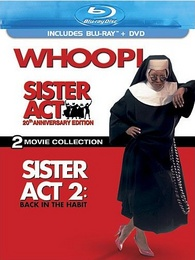 Touchstone presents 'Sister Act' & 'Sister 2' in a Blu-ray/DVD combo pack. Both films are presented on one BD-50 disc, along with separate DVD copies of each movie, all housed in a standard case. After some skippable trailers, the disc transitions to a standard menu. The packaging indicates that the release is region A, B and C compatible. Both movies are provided with a 1080p/AVC MPEG-4 transfer in the 1.85:1 aspect ratio. While the single disc presentation might alarm some fans, I didn't detect any notable compression artifacts and both flicks appear to share the space just fine. With that said, there are some minor issues with the image that seem to stem from the source elements and original photography. The print is in nice shape with only a few very minor specks here and there. Grain is present and natural looking throughout, but does fluctuate in degree from scene to scene, sometimes looking light and unobtrusive, and other times looking a bit heavy. On that same note, detail varies as well. The opening sequence (set in Reno) is actually quite impressive, with great clarity and depth (Goldberg's sparkly sequined dress pops from the screen). Unfortunately, this level of detail and dimension is not consistent, and several other scenes offer a comparatively soft and flat look. Colors are usually nicely saturated, but can also look a bit faded. Whites are solid, but black levels waver with slightly murky shadow detail. The sequel features a steadier but more underwhelming video presentation. The source print is in good shape with no major signs of damage. Grain levels are natural and stable throughout. Unfortunately, detail never reaches the same heights as the first film's more impressive moments, and clarity remains rather soft. Any real sense of dimension is also rare, and the image holds a flat, often washed-out appearance with dull colors. Blacks are stable, however, and overall contrast is fine. Each film is presented with an English DTS-HD MA 5.1 track. English SDH and Spanish subtitles are also available. Serviceable but a little disappointing, both films feature very similar mixes that suffer from the same front-loaded sound design and lack of immersion. With little surround activity, these 5.1 mixes aren't very enveloping. Still, the musical numbers do sound pretty good, and while a livelier soundstage could have enhanced the experience, these mixes are satisfying all the same. Unfortunately, Touchstone has not answered my prayers when it comes to the disc's special features. All we really get is a short behind-the-scenes featurette for the first film and a music video. 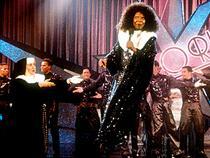 Come on, 'Sister Act' deserves more! 'Sister Act 2,' however, somehow deserves less -- which is rather remarkable considering it doesn't get any supplements at all. Inside Sister Act (SD, 13 min) - This is a pretty standard promotional look at the film's production with some cast & crew interviews and on-set footage. The film's inoffensive intentions are discussed along with details on the cast's singing abilities and lack of enthusiasm for their nun outfits. Brief and pretty superficial, there isn't a lot to get out of this. Theatrical Trailers (SD) - A theatrical trailer for each film is available on their respective DVD copies. I'll admit it, a lot of my love for 'Sister Act' is fueled by nostalgia, but beneath its slightly dated exterior lies a genuinely funny and entertaining flick. Unfortunately, the same cannot be said about its lazy follow-up, which is totally contrived and mediocre. The video transfers are both solid but a little underwhelming, and though serviceable, the audio mixes are a bit lacking. To the disappointment of many fans (or possibly just me), with the exception of one featurette, Touchstone has decided not to bless this release with any substantial extras. While the movie doesn't get the special edition treatment it deserves (it's 'Sister Act,' damn it!) the film still holds up well, but potential buyers are advised to ignore the unnecessary sequel that's regrettably slapped on the disc. As it stands, this is probably a release that will only appeal to fans (I can't be the only one).